December is fast approaching and is not only a firm festive favourite but is also my birthday month, in fact my birthday is a mere 6 days away. 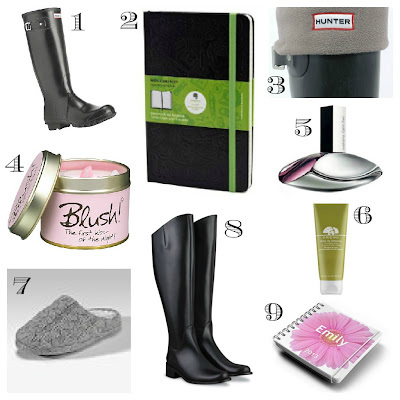 So here is my birthday wish list, and anything left over goes straight onto the Christmas list (lol)! So I moved to Bristol, and let me tell you a little secret - it rains! A lot! I'm fed up of getting wet feet which makes me miserable for the whole day. These are glossy and adjustable, what more could you want from something so practical. If your not already using Evernote to help you organise your life, then you need to be. I have since 2011 and it literally has my whole life on it. This notebook is designed to make photographing the notes even easier and so will really help when I'm planning some of my work projects. Also who would ever hate receiving stationery! I don't just want dry feet, but I want warm feet to, and these will be just perfect. I was given one of these as a present maybe 3 years ago for Christmas and I was hoooked. The whole range smells AMAZING but this one in particular is my favourtie. It is a strong floral, girly smell and I love, love, love it. It has a regular spot on any gift list I am creating! The whole range is available at John Lewis, and I suggest you go down and have a sniff. Check out my post on 'My Favourite....Fragrance' - nuff said. I have read so many great reviews on this, but I have such sensitive skin. So I went to Origins and got a tester and I love it. It makes my skin feel amazing and it also smells delicious too, and so the full size product has earned its way onto the wish list - fingers crossed. These also make a regular appearance as they are my favourite. They look snuggly and the fleece lining means they are. They also have memory foam soles, so they shape to your feet. My shoulders relax just thinking about slipping these on! Duo boots, is a shop (both online and in the real world) that specialises in making boots in a variety of calf and foot widths. So those of you with the skinnest and the curviest of legs can still get your hands on very fashionable shoes. I brought my first pair a couple of years ago, and until their recent demise wore them almost religiously from around October to April. It is time to invest in another pair and these have caught my eye. I have noted to the parentals, that I appreciate they are rather expensive so we could compromise and for one time only I would consider a joint birthday and Christmas present (one of the horrible things about having a birthday in December). I saw these on blogs from those who attended the Leeds #bblogger meet up and I'm hooked. Anything that says; stationery, personal, and organised has me hooked. The site allows you design your own diary or planner and upload your own cover and name. What could be more perfect for a budding blogger. such a great post *_* your blog is very good and interesting. im glad if you visit my blog, too <3 keep in touch!